Ravi Sreedharan (Ravi) was part of the leadership team at Azim Premji Foundation in Bangalore from 2011 to 2015. A year ago, he left the Foundation with a dream to build a world class, iconic, not-for-profit institute in the country dedicated to Development Management in the Development Sector. He is actively involved with the social sector and is on the Boards of SKID (a school for the Deaf in Bangalore), Ashraya (a very reputed NGO working on children’s education and women’s empowerment), and IIMPACT (works on educating and mainstreaming out of school girl children in the remote villages and habitations of the country) Ravi was the Head of Education Leadership & Management (ELM) at Azim Premji Foundation (APF). His area of focus was to get ELM into the discourse on Education in the country. His work was driven by the belief that, besides teacher quality, School Leadership plays a critical role in driving better learning levels and quality of education. Based on 5 years of working in the Development Sector, he likes to tread the middle path between Paralysing Theory and Mindless Implementation. In 2011, Ravi left the corporate sector to come and work in the Development Sector. He had spent nearly 25 years in the Corporate Sector, most of which was in the Multi-national bank HSBC where he held various senior posts including Regional Marketing Head for Middle East & Africa, Regional Product Manager for Asia Pacific, Country Head of Consumer Banking for Indonesia, and CEO & President Director of Bank Ekonomi (member of the HSBC Group). 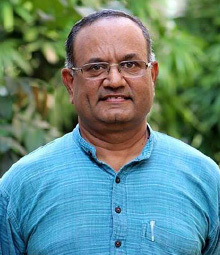 Ravi is a Mechanical Engineer from Institute of Technology – Banaras Hindu University (1985) and an MBA from Indian Institute of Management, Ahmedabad (1988). He has worked in Engineering, Advertising, Banking and now the Social Sector. Ravi has a lot of interests which range from Sports to Travel and from Music to Collecting coins/ currency. He has been a national level Basketball player and awarded the Institute’s Colour for his achievements. He also represented his Engineering College in Football, Handball, Softball and Volleyball. After his college days, he has also learnt and played club level Squash, Golf and Bridge. Ravi is married to Suma who is a Director at Child Rights and You (CRY) and they have two children – Keertana who is doing her Masters in Applied and Professional Ethics at Melbourne University, and Nimay who is doing his Under-grad in History at Knox College in the USA.